Unlike this week's other big release, this film seems more popular with the crowds than the critics. Following on (a mere few decades later) from when Dorothy had just returned home from her first incredible journey to Oz, she's already being called back for another adventure. After waking to post-tornado Kansas, Dorothy and Toto are whisked to Oz on a magical rainbow mover sent by their old friends the Scarecrow, the Lion and the Tin Man. Time in Oz has passed much faster than back in Kansas, and Dorothy discovers that the Jester, the devious brother of the Wicked Witch of the West, is taking Oz over one region at a time, holding their leaders captive and casting a pall of darkness over the beloved land. Naturally Dorothy and friends are required to solve the problem. 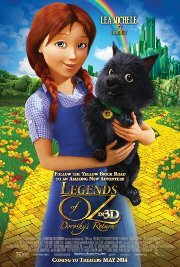 This film is releasing in 2D and 3D, this is the 3D version.